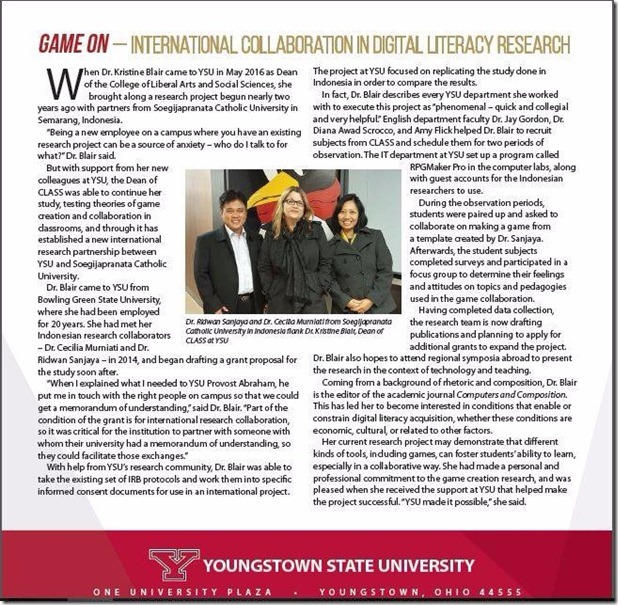 When Dr. Kristine Blair came to YSU in May 2016 as Dean of the College of Liberal Arts and Social Sciences, she brought along a research project begun nearly two years ago with partners from Soegijapranata Catholic University in Semarang, Indonesia. “Being a new employee on a campus where you have an existing research project can bee sourceof anxiety – who do I talk to for what?” Dr. Blair said. 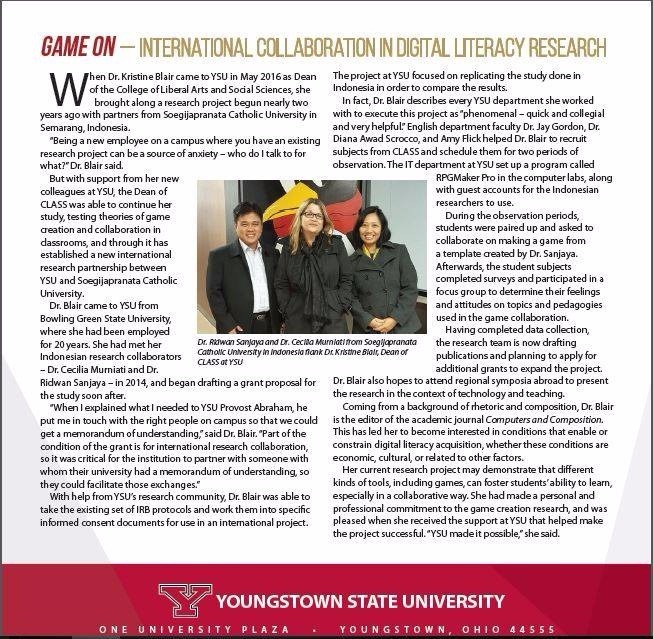 But with support from her new colleagues at YSU, the Dean of CLASS was able to continue her study, testing theories of game creation and collaboration in dassrooms, and through it has established a new international research partnership between YSU and Soegijapranata Catholic University. Dr. Blair came to YSU from Bowling Green State University, where she had been employed for 20 years. She had met her Indonesian research collaborators – Dr. Cecilia Murniati and Dr. Ridwan Sanjaya – in 2014, and began drafting a grant proposal for the study soon after. With help from YSU’s research community, Dr. Blair was able to take the existing set of IRB protocols and work them into specific informed consent documents for use in an international project. The project at YSU focused on replicating the study done in Indonesia in order to compare the results. In fact, Dr. Blair describes every YSU department she worked with to execute this project as ‘phenomenal – quick and collegial and very helpful.’ English department faculty Dr. JayGordon, Dr. Diana Awad Scrocco, and My Hick helped Dr. Blair to recruit subjects from CLASS a nd schedule them for two periods of observation.The IT department at YSU set up a program called RPG Maker Pro in the computer labs, along with guest accounts for the Indonesian researchers to use. During the observation periods, students were paired up and asked to collaborate on making a game from a template seated by Dr. Sanjaya. Afterwards, the student subjects completed surveys and participated in a focus group to determine their feelings and attitude on topics and pedagogies used in the game collaboration. Having completed data collection, the research team Is now drafting publicationsand planning to apply for additional grants to expand the project. Dr. Blair also hopes to attend regional symposia abroad to present the research in the context of technology and teething. Coming from a background of rhetoric and composition, Dr Blair isthe editor of the academic journal Computers and Composition. This has led her to become interested in conditions that enable or constrain digital literacy acquisition,whether these conditions are economic, cultural, or related to other factors. Her current research project may demonstrate that different kinds of tools, induding games,can foster students’abihty to learn, especially in a collaborative way. She had made a personal and professional commitment to the game creation research, and was pleased when she received the support at YSU that helped make the project successful. "YSU madeit possible", she said.